Exude the combined personality of the merger in 2016 between two giants in the industry while still showing time and cost savings? Learn how we did it. With a 110’ x 110’ space to work with, the immediate desire was to be a show stopper with a new look and feel, while integrating existing components and messaging. It had to exceed all expectations, create trust with the audience, and oh, by the way, be cost effective. Develop a floorplan that reduced the overall footprint from 170x140 to 110x110 without eliminating any product segments. We streamlined the attendee experience by grouping the 11 product segments in strategic clusters instead of a shotgun layout. By grouping the product segments, we were able to reduce the number of product counters from 42 to 24. From the attendee perspective, this made it easier for them to navigate to each station and find what they were looking for faster. Design and fabricate new exhibit properties that would seamlessly integrate with existing assets. We seamlessly integrated existing assets (including a two-story deck, storage space, and conference areas) into the new booth look and feel by layering on new design elements, such as new textures, lighting, and custom branded pieces. This allowed us to stay true to their brand intent and show cost savings by leveraging existing assets. Create a warm and inviting space by introducing materials not typically seen at medical shows. Prior to the merger, the brand personalities of Zimmer and Biomet were quite different. It was important that the booth design reflected the convergence of the two brands into one holistic identity. We stayed true to the clean lines and angular design, while adding elements of softness, like asymmetric shapes and rounded edges. We changed the lighting from cool to warm and highlighted with blue as an accent color. We introduced more warm materials and textures to complement the warm lighting and create a welcoming environment. From the wood print on the fabric video wall to the backlit logo paneling made to look like the outside of an aircraft, our attention to detail delivered a cohesive brand experience. Establish new relationships with existing client partners and strengthen overall communication and show execution. Act as intermediary and conduit across five different existing client partners—content development, lighting/AV hardware, freight, I&D/labor, and rigging/truss. We scheduled frequent touch-point calls with all partners and hosted multiple on-site meetings at Hamilton with labor and freight partners. We made on-site visits to the lighting and AV partner to ensure alignment with the overall design. 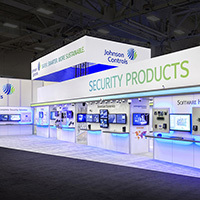 Improve pre-show planning and preparation to find operating costs savings on the show floor. Ship and set the existing 100’ long two-story deck to Hamilton where we created all new engineering drawings and labels for all physical pieces and respective crates. We matched each piece and crate to the engineering plans and set up documents so ensure an efficient set on the show floor. We replaced the standard plywood and laminate walls with our lightweight modular wall panel system to decrease material handling costs. The cost and time savings on the show floor resulted in “the fastest and easiest set ever” for the client. Today’s leaders are challenged to do more with less. Learn how trade shows deliver real results and finally answer the question "What are we getting for all this money we spend on trade shows?" If senior management is looking for measurable sales and marketing results, quantifiable return on their investment and bottom line growth, what contribution can trade shows play in achieving these goals? To find the answers, the Center for Exhibition Industry Research (CEIR) commissioned two independent studies. The results of these two studies are packaged by CEIR as "The Power of Exhibitions". (1) They are easy to measure. (2) They attract new prospects. (3) They attract prospects who buy. (4) They save money in the selling process. (1) Sales related objectives are easier to measure. With a proper lead tracking and follow-up system in place, you will be able to show eventual sales dollars from the show, providing the justification for the trade show. (2) Trade shows attract new prospects. You know the show influences their decision to buy, you know that the majority are planning to buy, and you know you have not seen them before. What a great selling opportunity! (3) Trade shows attract prospects who buy. A trade show is the only marketing vehicle that delivers a pre-qualified buyer directly to you in a face to face selling environment. They come to you, on your turf, expecting to be sold to. Take advantage of it! (4) Trade shows save money. When it comes to reaching buyers face-to-face, trade shows are more cost effective. The average cost for a field sales call (including direct cost, salaries, travel and entertainment) in 2015 was $425.00. Comparatively, the cost per exhibitor reached at a trade show (including direct cost, booth costs and staff costs) was $250.00... a 42% savings. (5) Trade shows save time. While costing less to reach buyers, trade shows also accelerate the selling process, reducing the number of sales calls to close a sale by 40%. In fact, with qualified trade show leads, the average number of sales calls required to close the sale is 1.4. With field sales, the number of calls to close jumps to 3.6. So if we combine the last two statistics, the total cost of sales is 45% less than the with trade show leads versus field sales. The bottom line is that trade shows are easy to measure, attract prospects who buy, are more cost effective, and accelerate the buying/selling process. So Jason, what did you do before you joined Hamilton? I worked at a scenery shop in Indianapolis. We worked on a lot of museums around Indianapolis like the Children’s Museum, Indiana State Museum, and Eiteljorg Museum. Before that, I worked at Disney as part of the Imagineering team in Los Angeles, California from 1992 to 2001. What makes a good craftsman? Having attention to detail, being meticulous, having a desire to do nice, high quality products and not minding getting dusty. Saw dust is just another term for man glitter! Every job has its own challenge and every project is different. I like the creativity of being a craftsman and having the tangible result of your work. Being able to work with your hands and seeing your hard work come to life is very rewarding. What is your biggest achievement to date, professional or personal? JR: When I was part of the Imagineering team at Disney, I worked on an attraction in 1995 called “The ExtraTERRORestrial Alien Encounter”. It was one of the scariest attractions at Disney World and had some of the best special effects I’ve ever seen at the park. It was really a great experience being able to do the build and the install for the project as a new lead. AN: It looks like your work was too good because it scared so many people that they had to close it down! JR: I do think it was too scary for a lot of people, but it’s unfortunate that Disney closed it down because it had an interesting story that was very different from anything else at the park. I like watching movies and I also like working on projects outside of work. I would love to build my own wooden sail boat. I would meet Sam Maloof. He is a renowned woodworker and craftsman that did a modern style of the Windsor chairs. It would be interesting to talk to someone like that. I have always enjoyed acting and I wanted to be an actor when I was younger. Since you worked at Disney, which Disney character would you want to be and why? I wouldn’t want to be someone too popular. I actually like the dad in 101 Dalmatians because he played the piano and composed music. He seems like a neat guy! Is there anything else you’d like to say about being a craftsman? If you want to be a craftsman, then just go out there and do it! We are seeing a lot less of the younger generations getting involved in the profession. Schools don’t teach industrial arts as much as they used to. They have transitioned more into computer-based skills. It’s starting to come back around again and that’s really exciting! There are probably a lot of people out there that don’t know about it that would be interested in being a craftsman if given the option. Check us out, we’re always looking for talented and trainable individuals to be a part of our team! Same show, same exhibit structure, for three years… oh, and with a completely different look and feel each year. Learn how we transformed our own booth at ExhibitorLIVE from a ski lodge, to a mid-century living room, to a craft beer hall. The original idea was to design an exhibit for our own industry event – the ExhibitorLIVE show – that could be re-purposed for three years yet create a completely different new look and feel concept each year. Was it possible to use the same basic structure and have it appear completely different for three years, thus creating savings on structure cost that could be used for creating a memorable experience for the audience? Absolutely. The Leads – Our total qualified leads collected the previous year was 51. The goal was to at least double that in 2016; to get over 100 qualified leads and keep that going for three years. The Buzz – Another, perhaps less measurable, goal was to ‘generate a buzz’ on the show floor – to create some positive energy about the company with the audience and in the industry. The Camaraderie – A third internal goal was to use this time together at the show to create camaraderie – to build a stronger sales team for the company. Hamilton’s vision was to create a casual, comfortable, approachable place to visit; a place to engage in conversation with this target audience in an atmosphere that was non-threatening and promoted the exchange of information. This year’s theme is built around the idea that we are “The Perfect Mix” for our clients when it comes to planning and executing their face-to-face marketing activities. We have the experience, the expertise and passion to work with our clients to develop their event objectives, create an environment and execute the project so that it helps them achieve their objectives and show a positive return on investment. In the Hamilton Lodge we served trail mix to all booth visitors; attendees chose from a selection of 10 different items on the fresh trail mix bar. The bar was set up so that while attendees were choosing their snack our staff could interact with them. In addition to the lodge theme and trail mix bar, while in the booth attendees could try their hand at skiing down a slope on our interactive Wii Ski Game on a large monitor in the booth. And they could talk with our staff and walk through our capabilities and portfolio on one of six iPads loaded with lots of cool images. This year Hamilton’s vision was similar to our ExhibitorLIVE 2016 design; to create a casual, comfortable, approachable place for attendees to visit. A place to engage in conversation with this target audience in an atmosphere that was non-threatening and promoted the exchange of information. The exhibit was updated from our ski lodge theme "The Perfect Mix" to showcase Hamilton's "70th Anniversary" using a mid-century modern style. This year’s theme was built around the 70th Anniversary of the company, and the mid-century modern design language of the period. In addition to the structure and props, attendees heard the sounds of the era as well from our background music. In the Hamilton ‘living room’ we served several classic martini’s, both alcoholic and non-alcoholic, to all booth visitors so that while attendees were choosing their drink our staff could interact with them. While the exhibit and theme may have been from the mid-century era, there was plenty of technology from today to go around. The augmented reality, virtual reality, viewmasters, and iPads, offered a range of opportunities for our guests to experience our work. Hamilton’s vision for ExhibitorLIVE this year, Craft House, was to create an atmosphere that showcases our craft as well as engaging our audience in a relaxed, refreshing environment. Our open, inviting space allowed attendees to explore our exhibit as well as unwind at the bar for a selection of craft beers. Each side of the exhibit had a unique experience for attendee interaction. This year’s goal was to inspire and educate potential leads while instilling confidence in Hamilton’s ability to create a memorable experience. In the Hamilton Craft House, we served a variety of craft beers from Big Dog’s Brewery, a local craft brewery in Las Vegas, along with two ciders and a root beer, to all booth visitors, so that while attendees are choosing their drink our staff can interact with them. Hamilton’s Craft House exhibit was an update of last year’s, 70th Anniversary, mid-century modern theme; which was an update of the previous year’s Hamilton Lodge theme. Re-inventing an experience using existing materials with minor modifications does require some planning ahead, but the overall cost savings can be quite substantial. THE ATTRACTION This year we partnered with STAMM Media to provide a ‘Party Wall’ for the back side of the exhibit. The 5’ high x 8’ long LED wall uses an integrated camera to capture movement and replicate it on the wall. As the audience moves, it is ‘reflected’ on the LED wall. When not in motion, the wall showed the Hamilton Craft House logo and a set of descriptive phrases. Experience: Reuse a portion of the booth structure once again and reinvest the savings to incorporate our wish list items including high tech and low-tech interactives for increased guest engagement. This helped create a comfortable and inviting experience for our visitors. The Hamilton "Craft House" served 850 craft beverages confirming our engaging, open, and inviting atmosphere was THE place to interact with and entertain visitors at the show. Hamilton wanted to prove that our strategic planning can help companies maintain a fresh look and feel at each show without the pressure of another capital expenditure every time. 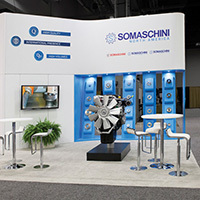 By defining clear goals in the beginning, we were able to improve our exhibit experience year over year by strategically reusing booth components and reinvesting those savings from of our original 3-year exhibit program investment. By year 3 we had incorporated all of our wish list items into our booth experience and exceeded our predefined goals for each year. As part of our 70th Anniversary celebration, we recently updated our Indianapolis headquarters! The improvements come at a time of continued growth and reflects our commitment to creating process efficiencies which deliver an enhanced level of service that our clients have come to rely on. We set out to create a new office layout and design finishes that was comfortable while providing all the features of a highly collaborative and creative workplace. We also have clients and potential clients visiting our facility, so it was a great opportunity to showcase our design talents by including inspirational features throughout our ‘tour stops’. Offices with glass walls allow natural light into the interior of the workspace. Additional office spaces will allow for the expansion of our Client Team Directors department as well as our Project Management department. A new conference room allows for additional collaboration between the client teams. Art/Interactives are being incorporated to inspire creativity and create conversations as they would at a client’s trade show, event, or permanent environment. Every detail was considered as we thoroughly worked through the layout of our newly remodeled second floor office module. With a focus on efficiency and collaboration, while also being respectful of privacy, we wanted to provide a welcoming feel with new textures, colors, and lights. We strategically positioned departments to drive more collaboration on projects from start-to-finish. Stand-up, open meeting spaces encourage participation from others. Inviting, collaborative spaces welcome our internal teams, clientele, and prospects. We look forward to hosting you on your next visit to Hamilton Exhibits! Hamilton is a face-to-face marketing company offering trade show and event strategy, design, production, and project management services to a wide range of industries around the world. We create memorable brand experiences that engage audiences through sight, sound, touch, curiosity, and imagination.